This is a Chinese name; the family name is Tao. 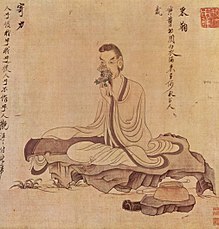 Tao Yuanming (365?–427), also known as Tao Qian (Hanyu Pinyin) or T'ao Ch'ien (Wade-Giles), was a Chinese poet who lived during the Eastern Jin (317-420) and Liu Song (420-479) dynasties. He is considered to be one of the greatest poets of the Six dynasties period. Tao Yuanming spent most of his life in reclusion, living in a small house in the countryside, reading, drinking wine, receiving the occasional guest, and writing poems in which he often reflected on the pleasures and difficulties of life in the countryside, as well as his decision to withdraw from civil service. His simple, direct, and unmannered style was at odds with the norms for literary writing in his time. Although he was relatively well-known as a recluse poet in the Tang dynasty (618-907), it was not until the Northern Song dynasty (960-1127), when influential literati figures such as Su Shi (1037-1101) declared him a paragon of authenticity and spontaneity in poetry, that Tao Yuanming would achieve lasting literary fame. He is also regarded as the foremost representative of what would latter be known as Fields and Gardens poetry, a style of landscape poetry that found inspiration in the beauty and serenity of the natural world close at hand. This article is about a poet. For a warlord, see Tao Qian (Han dynasty). In the middle of his life, Tao changed his name (keeping his family name) from Tao Yuanming (traditional Chinese: 陶淵明; simplified Chinese: 陶渊明; pinyin: Táo Yuānmíng; Wade–Giles: T'ao Yüan-ming) to Tao Qian (simplified Chinese: 陶潜; traditional Chinese: 陶潛; pinyin: Táo Qián; Wade–Giles: T'ao Ch'ien). "Master of the Five Willows", which he used when quite young, seems to be a soubriquet of his own invention. There is a surviving autobiographical essay from his youth in which Tao Yuanming uses "Five Willows" to allude to himself. After this, Tao refers to himself in his earlier writings as "Yuanming"; however; it is thought that with the demise of the Eastern Jin dynasty in 420, that he began to refer to himself as "Qian", meaning "hiding", as a signification of his final withdrawal into the quiet life in the country and his decision to avoid any further participation in the political scene. Tao Qian could also be translated "Recluse Tao". However, this in no way implies an eremitic lifestyle or extreme asceticism; rather a comfortable dwelling, with family, friends, neighbors, musical instruments, wine, a nice library, and the beautiful scenery of a mountain farm were Tao Qian's compensation for giving up on the lifestyle of Tao Yuanming, government servant. Tao Yuanming's great-grandfather was the eminent Eastern Jin general and governor, Tao Kan (259-334), and his grandfather and father also both served as government officials. However, the family circumstances into which Tao Yuanming was born were only those of moderate poverty and lack of much political influence. Tao Yuanming is generally believed to have been born in the year 365 CE in Chaisang (柴桑) (modern Jiujiang, Jiangxi), an area of great natural beauty. However, there is some uncertainty regarding this date, and the Chinese scholar Yuan Xingpei has argued that Tao was actually born in 352. The name of his ancestral village, Chaisang, literally means "Mulberry-Bramble". Nearby sights included Mount Lu, Poyang Lake (then known as P'eng-li), as well as a good selection of nature's features located in the immediate vicinity of Chaisang. Tao Yuanming ended up serving more than ten years in government service, personally involved with the sordid political scene of the times. He served in both civil and military capacities, which included making several trips down the Yangzi to the capital Jiankang, then a thriving metropolis, and the center of power during the Six Dynasties. The ruins of the old Jiankang walls can still be found in the modern municipal region of Nanjing. During this period, Tao Yuanming's poems begin to indicate that he was becoming torn between ambition and a desire to retreat into solitude. Tao Yuanming had five sons. In the Spring of 405, Tao Yuanming was serving in the army, as aide-de-camp to the local commanding officer. The death of his sister together with his disgust at the corruption and infighting of the Jin Court prompted him to resign. As he himself put it, he would not "bow like a servant in return for five bushels of grain" 為五斗米折腰, a saying which has entered common usage meaning "swallowing one's pride in exchange for a meager existence" (the 'Five bushels of grain' being the specified salary of certain low-rank officials). For the last 22 years of his life, he lived in retirement. Tao Qian died in 427, probably at the age of 63. If, however, he was in fact born in 352, he would instead have been 76 years old when he died. Approximately 130 of his works survive: mostly poems or essays which depict an idyllic pastoral life of farming and drinking. Because his poems depict a life of farming and of drinking his home made wine, he would later be termed "Poet of the Fields". In Tao Yuanming's poems can be found superlative examples of the theme which urges its audience to drop out of official life, move to the country, and take up a cultivated life of wine, poetry, and avoiding people with whom friendship would be unsuitable, but in Tao's case this went along with actually engaging in farming. Tao's poetry also shows an inclination to fulfillment of duty, such as feeding his family. Tao's simple and plain style of expression, reflecting his back-to-basics lifestyle, first became better known as he achieved local fame as a hermit. This was followed gradually by recognition in major anthologies. By the Tang Dynasty, Tao was elevated to greatness as a poet's poet, revered by Li Bai and Du Fu. Han poetry, Jian'an poetry, the Seven Sages of the Bamboo Grove, and the other earlier Six dynasties poetry foreshadowed some of Tao's particular symbolism and the general "returning home to the country" theme, and also somewhat separately show precursory in evolving of poetic form, based on the yuefu style which traces its origin to the Han dynasty Music Bureau. An example given of the thematic evolution of one of Tao's poetic themes is Zhang Heng's Return to the Field, written in the Classical Chinese poetry form known as the fu, or "rhapsody" style, but Tao's own poetry (including his own "Return to the Field" poem) tends to be known for its use of the more purely poetic shi which developed as a regular line length form from the literary yuefu of the Jian'an and foreshadows the verse forms favored in Tang poetry, such as gushi, or "old-style verse". Tao's poems, prose and their combination of form and theme into his own style broke new ground and became a fondly relied upon historical landmark. Much subsequent Chinese painting and literature would require no more than the mention or image of chrysanthemums by the eastern fence to call to mind Tao Yuanming's life and poetry. Later, his poetry and the particular motifs which Tao Yuanming exemplified would prove to importantly influence the innovations of Beat poetry and the 1960s poetry of the United States and Europe. Both in the 20th century and subsequently, Tao Yuanming has come to occupy a position as one of the select group of great world poets. how should it not be hard? In the empty rooms—leisure and deep stillness. only a poem calms a soul that's torn. You'd understand me, Tao Qian. I wish a little sooner I was born! Aside from his poems, Tao is also known for his short, influential, and intriguing prose depiction of a land hidden from the outside world called "Peach Blossom Spring" (桃花源記). The name Peach Blossom Spring (桃花源 Tao Hua Yuan) has since become the standard Chinese term for 'utopia'.Recently, in September of 2018, Johnson K. Gao composed a song for the poem "Peach Blossom Spring" and published at https://www.sheetmusicplus.com/title/peach-spring-wonderland-digital-sheet-music/20800995?ac=1. [Yuanming's] sincerity is true and traditional, his verbalized inspirations supple and relaxed. When one reads his works, the fine character of the poet himself comes to mind. Ordinary men admire his unadorned directness. But such lines of his as "With happy face I pour the spring-brewed wine," and "The sun sets, no clouds are in the sky," are pure and refined in the beauty of their air. These are far from being merely the words of a farmer. He is the father of recluse poetry past and present. 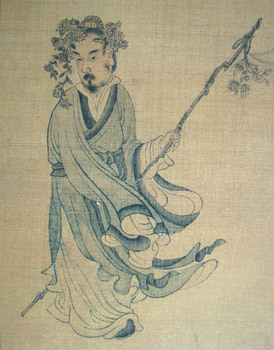 Su Shi (1037–1101), one of the major poets of the Song era, said that the only poet he was particularly fond of was Yuanming, who "deeply impressed [him] by what he was as a man." Su Shi exalted Yuanming's "unadorned and yet beautiful, spare and yet ample" poems, and even asserted that "neither Cao Zhi, Liu Zhen, Bao Zhao, Xie Lingyun, Li Bai, nor Du Fu achieves his stature". Lin Yutang (1895–1976) considered Yuanming the perfect example of "the true lover of life". He praised the harmony and simplicity in Yuanming's life as well as in his style, and claimed that he "represents the most perfectly harmonious and well-rounded character in the entire Chinese literary tradition." Tao Yuanming has inspired not only generations of poets, but also painters and other artists. Tao Yuanming by Min Zhen, 18th century. From the book Wan hsiao tang-Chu chuang -Hua chuan（晩笑堂竹荘畫傳）, published in 1921（民国十年）. Master Jingjie, hanging scroll, ink on paper, 106.8 x 32.5 cm. Located at the Palace Museum, Beijing. Jing Jie is the posthumous name for Tao Qian, the poet from the Jin Dynasty. The text at the top is from the Ci style poem 歸去來兮. A Song Dynasty painting on silk portraying Tao's return to seclusion in the mountains, early 12th century. Li Peng (c. 1060-1110) inscribed a poem on this handscroll entitled Returning Home in honor of Tao Qian, otherwise known as Tao Yuanming. A bamboo brush holder or holder of poems on scrolls, created by Zhang Xihuang in the 17th century, late Ming or early Qing Dynasty. In fanciful Chinese calligraphy in Zhang's style, the poem Returning to My Farm in the Field by the 4th century poet Tao Yuanming is incised on this cylindrical bamboo holder. The Three Laughers of Tiger Ravine, Soga Shohaku (1730-1781)khuy. Depicts Huiyuan (Chinese 慧遠; Hui-Yuan, Hui-Yüan in Mandarin or Fi-Yon in Gan) (334–416 AD); Tao Qian (simplified Chinese: 陶潜; traditional Chinese: 陶潛; pinyin: Táo Qián; Wade–Giles: T'ao Ch'ien) (365–427); and Lu Xiujing (chin. 陸修靜, W.-G. Liu Hsiu-ching; born 406; died 477). Song Dynasty painting in the Litang style illustrating the theme "Confucianism, Taoism and Buddhism are one". Depicts Taoist Lu Xiujing (left), official Tao Yuanming (right) and Buddhist monk Huiyuan (center, founder of Pure Land) by the Tiger stream. The stream borders a zone infested by tigers that they just crossed without fear, engrossed as they were in their discussion. Realising what they just did, they laugh together, hence the name of the picture,Three laughing men by the Tiger stream. The Tale of the Peach-Blossom Land inside of the Long Corridor. Meng Erdong ed. Tao Yuanming Ji Yi Zhu ISBN 7-80626-064-1. David Hinton (translator). The Selected Poems of T'ao Ch'ien (Copper Canyon Press, 1993) ISBN 1-55659-056-3. Davis, A.R. T'ao Yuan-ming (Hong Kong, 1983) 2 vols. Hightower, James R. Poetry of T'ao Ch'ien ISBN 0-19-815440-2. Xiaofei Tian. Tao Yuanming and Manuscript Culture: The Record of a Dusty Table ISBN 978-0-295-98553-4. ^ Tian, Xiaofei (2013). "From the Eastern Jin through the early Tang (317–649)" in The Cambridge History of Chinese Literature, Volume 1. Cambridge, U.K.: Cambridge University Press. pp. 221–2. ISBN 1107643244. ^ Tian, Xiaofei. "From the Eastern Jin through the early Tang (317–649)". pp. 221–2. ^ a b Yuan & Knechtges (2014), p. 1091. Holzman, Donald. "A Dialogue with the Ancients: Tao Qian's Interrogation of Confucius" in Scott Pearce, Audrey Spiro, Patricia Ebrey (eds. ), Culture and Power in the Reconstitution of the Chinese Realm, 200-600. Harward, 2001:75-98. Liao, Zhongan, "Tao Yuanming". Encyclopedia of China (Chinese Literature Edition), 1st ed. Tian, Xiaofei (2010). "From the Eastern Jin through the early Tang (317–649)". In Owen, Stephen (ed.). The Cambridge History of Chinese Literature, Volume 1: To 1375. Cambridge: Cambridge University Press. pp. 199–285. ISBN 978-0-521-11677-0. Yuan, Xingpei; Knechtges, David R. (2014). "Tao Yuanming 陶淵明". In Knechtges, David R.; Chang, Taiping (eds.). Ancient and Early Medieval Chinese Literature: A Reference Guide, Part Two. Leiden: Brill. pp. 1090–1124. ISBN 978-90-04-19240-9. Wikimedia Commons has media related to Tao Qian.